Simplify. Are you kidding me? My jaw hangs open. I am astounded. Do you ever wonder how things happen that seem so serendipitous? So random, and yet, so planned. Like a happy accident. That’s how I felt when I counted to eleven on my Google image search. Obviously I am destined to read this book. Whether is will help me solve my current dilemma or simply add to it, I don’t know yet. Like any good reader/writer, there is a bit of chaos, semi-controlled, here and there about my home. Sometimes the chaos is winning, sometimes I am. Freshly dusted flat places become receptacles for a few papers, a magazine, a DVD, and a mountain begins to grow. Okay, maybe only a small hill. But piles erupt spontaneously as if to taunt me. I try to stay on top of it, but work, family stuff, errands, writing, reading, eating, volunteer stuff, laundry, cooking, sleeping, all seem to get in the way of the housekeeping. I usually have a few, (okay, many) books around the house in different stages of “readingness.” Bookmarked, dog-eared, left open cover up, left open cover down, an empty mug holding the page, another book holding the page open. It gets a little silly. But, let’s be clear; books are not clutter. No way! 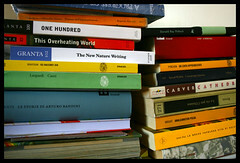 One day one of those hill-like piles had a book on the topic of decluttering perched precariously at its peak. It was Clutter’s Last Stand if I remember correctly. Although, it could have been half a dozen other books on the subject of dejunking, organizing, winning the lottery merely to hire a full-time maid, simplifying, streamlining, or decluttering. I own a few books on those topics. My husband thought that particular dusty book, resting on a pile of stuff and clutter was the funniest thing he’d ever seen. The clutter and the chaos drives me crazy! Trying to tackle it all myself with what little energy I have left after work and on weekends. Not so much a solution, more a self-inflicted bad mood. Enlisting the help of family members met with more success when the children were much younger, didn’t hold down jobs or go to school or date. MSH is a bit perfectionistic and takes a really long time, but he builds a pretty nifty set of shelves. I buy books on the subject of decluttering. 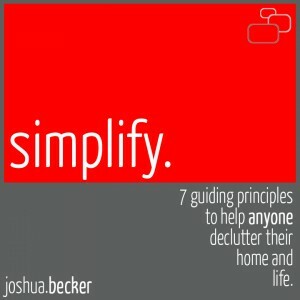 I read books on the subject of clutter and how to manage it, reduce it, or live with it. I actually declutter a little. I dream about implementing all the amazing ideas in the books. We move to a bigger house. We move to a smaller house. I secretly hope for a small disaster that wipes the slate clean. I feel the weight of the nonsense surrounding me. The already full sink of dishes when I’d just spent half an hour washing them up taunts me. The overflowing laundry basket snickers at me. The opened box of Halloween decorations I have yet to put up cackles. The unswept floor sends shivers up my spine. The bathrooms rival any haunted house. The garage is the stuff of nightmares. Seriously, there aren’t that many people living here. We’re gone half the time working, and asleep the other half. The stuff all out-of-place makes me wonder if it all gets up and wanders around at night or while I’m gone to work and flings itself about in wild, unfettered revelry. No wonder I conjured the word “simplify” when I sat down at the computer. I consider staying up all night to make a dent in the piles. MSH made the bed the bed this morning, and it looks inviting, calls to me, sings comforting, happy songs to lull me over to it. The pillow joins in with harmony. The alarm stares in a hypnotizing blink. It’s much, much too late to attempt tackling any of the chaos and nonsense.